Since founding Encore three years ago, I’ve become fascinated, obsessed and enthralled by two-sided marketplace businesses. Marrying the needs of supply and demand through a platform that provides more value than a direct transaction is a complex problem that every marketplace founder needs to solve quickly in order to scale. You’re essentially building two startups at once, with two sets of users: your customers, and your suppliers. I was told by a VC in 2015 that I had no idea what I was getting myself into by starting a marketplace business, and that it would be harder than I could imagine. They certainly weren’t wrong, but they probably didn’t expect me to relish this challenge and enjoy every aspect of trying to solve it. Two years on, Encore is now the largest musicians’ network in the UK and one of Europe’s fastest-growing music startups. Having met with dozens of marketplace founders, it’s become clear to me that we all face the same problems. Growing supply and demand in equal measure to achieve liquidity. Though we all operate in different industries, we can learn a lot from each other by discussing strategies and growth tactics, and so I’m beginning a podcast that does just that. 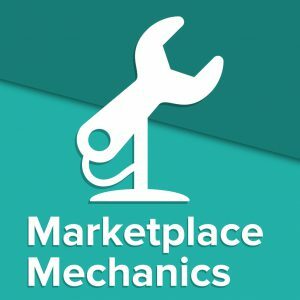 The podcast will be called Marketplace Mechanics. I’ll be interviewing founders and operators of two-sided marketplaces, ranging from pre-seed companies all the way up to public companies. We’ll discuss the origin stories of different marketplace startups, their approaches to common problems, and lots more. I’ll also intersperse these founder episodes with interviews featuring investors with marketplace expertise. Having advised multiple marketplaces in their portfolio, investors are incredibly well-placed to spot patterns and apply solutions from one company to another. I’ve certainly learned a lot from the UK and US investment community. The first episode will be available in early August, and features Dan Binsbergen, CEO of Lexoo — a marketplace matching businesses with lawyers. To subscribe to the podcast, simply email me (jm [at] encoremusicians.com) to join the mailing list. I’ll send out episodes manually until the list is big enough that I need Mailchimp (did someone say MVP?). Likewise, if you’re building your own marketplace and want to be interviewed, please get in touch! I can’t wait to share these stories with you.